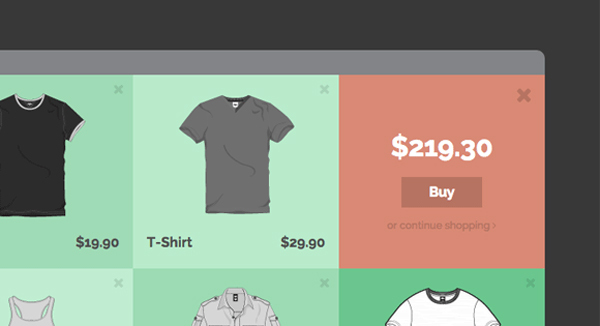 This a collection and tutorial of some fun effect and layout ideas for the first step of a checkout process in an online store by Codrops.Mary Lou is using morphing buttons concept together with CSS transforms and transitions. The checkout process in online stores is one of the most challenging and crucial in terms of UI design. Done well it can create a pleasant and smooth purchasing experience for the user; done wrong, it can lead to an abandoned shopping cart and no sale at all. There are many carefully planned and well designed e-commerce sites out there and making the UI uncluttered is definitely a great trend welcomed by anyone who buys things online. The demos show how you can make the peek into the shopping cart, one of the potential first steps of the purchase process, more fun and engaging while exploring some new layouts and effects.